1. Divide dough into 4 pieces. Roll each one out to about an 8 inch circle. 2. Spread 2 Tablespoons of pizza sauce on half of the dough, leaving a 1-inch lip around the outside with no sauce. 3. Arrange about 1/2 cup of pizza ingredients, 2 Tablespoons of parmesan and 1/4 cup of mozzarella on top of the pizza sauce on each piece of dough. Be sure not to put ingredients on the 1 inch border. 4. Brush the edges of the dough with water and fold the dough over while pushing out any air trapped by the dough. Seal the edges well. 5. Place calzones on a baking sheet that was sprayed with pan spray. Bake in a 375 F oven for 25-30 minutes or until well browned. 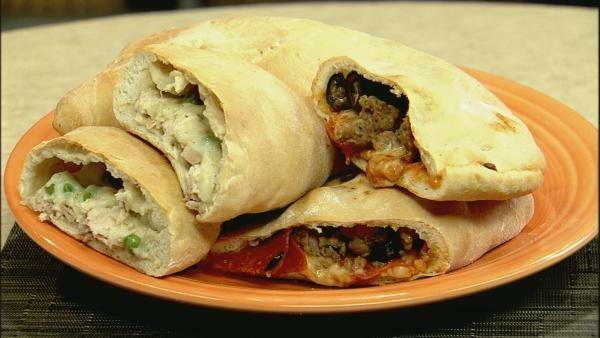 Remove from oven and transfer the calzones to a baking sheet to cool. Keep refrigerated until needed and warm in a microwave or oven before eating. They can also be eaten cold. Prepare dough as above. Spread 2 Tablespoons of alfredo sauce on half of the dough, leaving a 1-inch lip around the outside with no sauce. Arrange about 1/2 cup of chicken, 1/4 cup peas, 1 Tablespoons of parmesan and 1/4 cup of mozzarella on top of the alfredo sauce on each piece of dough. Be sure not to put ingredients on the 1 inch border. Follow baking instructions above.